Incredibly, this is the only map printed of tiny but nice Andorra, one of the oldest independent coutries in the world. In summer, this is a major ski resort area; in summer, a major hiking area. 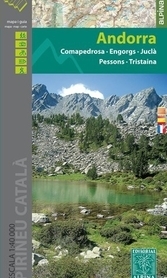 The map shows roads, railways and pedestrian paths as well as mountain huts, museums, leisure activities (hiking, skiing, mountain biking, kayaking, etc. ), petrol stations and tourist information offices. The map also includes an enlargement showing a street plan of the capital Andorra la Vella.